Like many of his friends, Alejandro Soto’s marriage fell apart in battle against the multinational oil corporation Chevron-Texaco. Devastation of his farm from oil contamination has meant he can barely provide for his family, and trying to get U.S. multinational Chevron-Texaco to clean it up has eaten up most of his time and energy. About 80 times larger than BP’s Deepwater Horizon spill, the “Amazon Chernobyl” was not the result of equipment failure or company negligence. 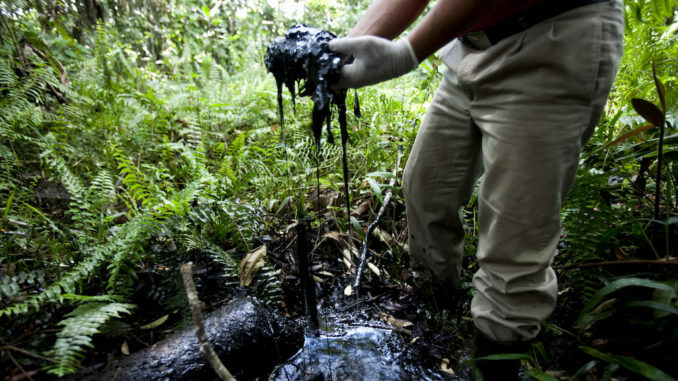 According to a 2013 ruling by Ecuador’s Supreme Court, Chevron-Texaco — which drilled for oil in the country from the 1970s to the early 1990s — intentionally dumped billions of gallons of difficult-to-refine crude and toxic formation waters into open, unlined pits and directly into rivers and streams surrounding its operations. 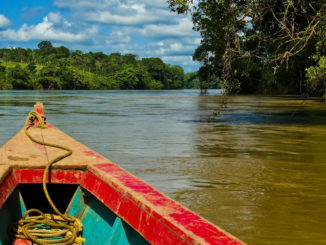 To this day, this waste disposal cost-prevention measure continues to release harmful substances, such as benzene and mercury, into the Amazon. 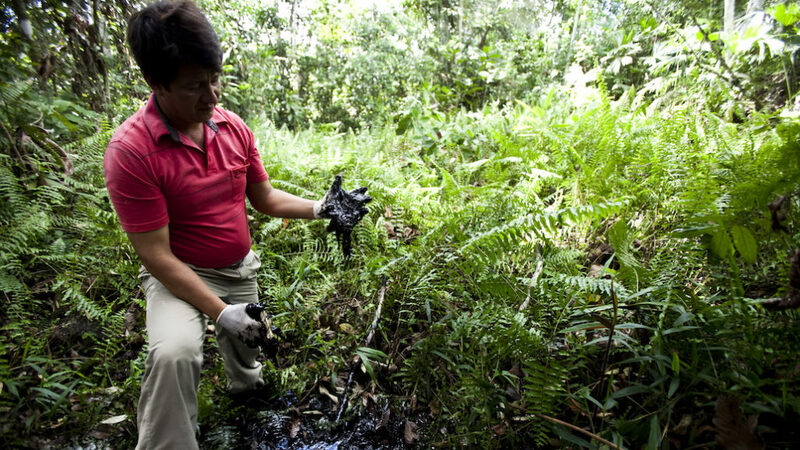 Ecuador’s highest court ordered Chevron-Texaco in 2013 to pay the $9.5 billion (now $12 billion with interest) to clean up the mess. But the oil giant has dismissed the legitimacy of the judgment, calling it “unenforceable” through a number of countersuits launched against the affected people and their legal team. In 2014, U.S. Judge Lewis Kaplan, who refused to consider any of the environmental evidence and made disparaging comments about the affected people, found the Ecuadorean judgment was the product of fraud. The Ecuadorean plaintiffs, along with the NGOs Amazon Watch and Earth Rights International, among others, countered that Kaplan’s decision is the real product of fraud, given that his decision rested on a witness paid $2 million by the company who afterward admitted he lied under oath. Judge Kaplan also held undisclosed investments in the company during the trial. Despite these irregularities, however, a U.S. appeals court, affirmed Judge Kaplan’s decision in August 2016. The appeals court did not conduct an independent analysis of Kaplan’s ruling to fact-check his findings, even though several Ecuadorean judges had different conclusions. Shortly after the 2016 U.S. presidential election, the U.S. Supreme Court declined to review the case, drawing international indignation for challenging the democratic and sovereign nature of Ecuador’s court system and the principle of comity, more generally. Notably, it was the company that moved the case to Ecuador in 2001 amid resistance from the Ecuadorean plaintiffs. Pablo Fajardo, a winner of the Goldman Environmental Prize for his work representing the Ecuadorean plaintiffs, has called Chevron-Texaco’s retaliation “judicial terrorism.” It is in reference to the double-victimization of the affected people: first, by the destruction of their land and communities, and second, by being painted as shakedown artists, involved in a supposed conspiracy to extort riches from the oil industry’s deep pockets. On its website, Chevron claims that it “never operated in Ecuador,” even though it did so as Texaco from 1964 to 1992. While Chevron acquired Texaco in 2001, the company maintains that it was only a “minority partner in an oil production consortium in Ecuador,” and was released from environmental liability through a 1998 agreement with the state oil company PetroEcuador. By way of that agreement, Chevron argues that it remediated a number of its well sites, while PetroEcuador committed to performing any additional clean-up. According to Ecuador’s Supreme Court, however, Chevron-Texaco was the exclusive operator of the oil fields and was the sole party to make the decision to improperly dump the toxic wastes, notwithstanding that there were minority partners in the consortium who also benefited from its decisions. Critics of Chevron-Texaco’s “corporate veil” defense, meanwhile, see this as akin to a murderer changing his name in order to recuse himself from responsibility for the murder. “There’s been no remediation,” Soto asserts. Through “toxic tours” of the contamination in question that he and other affected people host for those wanting to see it, he shows that “remediation” amounted to little more than covering the pits with soil. In many cases, the pits remain open. At well site Sacha 61 (Sacha is one of six oil fields in the area that Chevron-Texaco operated), black, tar-like crude envelopes a 60 foot by 100 foot swath of forest that is too waterlogged to walk across, but stiff enough to bounce rocks off. Soto believes the run-off from pits like that one, affecting the water and food that locals rely on, is the reason why he lost his brother and father to cancer. U.S. Attorney Steven Donziger began to work on behalf of Soto and a large group of the affected people in 1993, fresh out of Harvard Law School. Today, Chevron-Texaco is trying to impose on Donziger a $33 million costs order to pay the opposing party’s legal fees, which Donziger views as retaliation for his advocacy and an attempt to personally bankrupt him. Many human rights and civil liberties groups see the motion as a legal abuse meant to censor and intimidate those seeking corporate accountability. Donziger, meanwhile, remains focused on the affected people, and is continuing to pursue enforcement of the Ecuadorean judgment in Canada, where the company has an estimated $15 billion in assets. Since 1993, when the class-action lawsuit against Chevron-Texaco originally was filed in U.S. federal court, some advocates for the affected communities have withdrawn from the campaign because of the toll it took on their personal lives or businesses. Those seeking to hold the company accountable have frequently been the targets of threats, invasive subpoenas, and reputation-bashing campaigns funded by Chevron’s 60 law firms and six public relations firms. Even so, according to Donziger, this is not a case that lawyers can easily walk away from. In fact, far more have joined the campaign against Chevron in recent years than have left it. Nearly every community leader and advocate who has stuck it out has overcome obstacles through their commitment to healing the disaster. For one U.S. woman engaged in the fight who wished to remain anonymous, her commitment greatly comes from the memory of mothers bathing their children in oil-slicked water on a trip she took to the affected area years ago. For Soto, the drive to continue fighting is fueled by the hurt he felt when told by authorities he could not donate his own blood to try to save his brother before he died. He says he was turned down on account of the contamination compromising the blood supply of everyone living amidst Chevron-Texaco’s former drill sites. According to a Quito-based Red Cross functionary, the organization has no such policy toward people living in affected areas, and a donor would likely be turned away based on personal health issues. But Soto claims that he was barred from donating as a result of an unspoken rule that others from his community have also experienced. When one witnesses the immense destruction of the Ecuadorean Amazon from oil exploitation and the intimidation and health impacts that its defenders have faced, one must ask how the affected peoples have maintained the fight for more than 24 years. “There’s a lot of altruism in all of this,” he added, alluding to the fact that struggle often focuses on the rights and wellbeing of future generations and the rainforest itself. Since Chevron-Texaco liquidated its assets in Ecuador in order to protect them from being seized, Soto and his colleagues have had to rely on courts in foreign jurisdictions where the corporation maintains interests in oil fields and refineries to enforce the 2013 Ecuador judgment. In the latest chapter of the saga, enforcement hearings against Chevron were scheduled to take place on Oct. 10 and 11 in Toronto at the Ontario Court of Appeal. However, Chevron demanded a $1 million cost order from the Ecuadorean plaintiffs before the case could proceed further due to a quirk in Canadian law. It is a quirk that can be used to make plaintiffs demonstrate their ability to pay the defendant’s legal fees in case they should lose — a charge that the Ecuadoreans’ lawyers argued would place an unfair burden on poisoned people who live in makeshift homes without running water. On Oct. 31, a three-judge panel in Canada ruled in favor of the Ecuadoreans, denying the $1 million cost order on account that it appeared to be nothing but “a measure [by Chevron] intended to bring an end to the litigation.” During the proceedings ahead of the decision, key supporters — including Greenpeace co-founder Rex Weyler, National Chief of the Assembly of First Nations Phil Fontaine, who is the leader of more than 600 Indigenous groups in Canada, and former Pink Floyd musician Roger Waters — gathered with others in front of the courthouse to express outrage against Chevron’s latest attempt to evade paying for clean-up. Along with First Nations political leader Grand Chief Edward John and Aboriginal rights lawyer Peter Grant, Fontaine and Weyler recently visited Ecuador where they met with Soto and other key actors in the struggle, and saw the contamination firsthand. Weyler, who is known for his direct action work and reporting on environmental abuse around the world, commented that the disaster is “probably the worst” he’s ever witnessed. Grant concluded the visit by joining the Ecuadoreans’ legal team. In between stops at contaminated sites, the Canadian leaders visited a cemetery in the town of San Carlos, where some of the highest rates of toxic exposure-related illnesses and deaths have been recorded. Placing flowers on the grave of nurse Rosa Moreno, who dedicated her life to helping the sick before she herself succumbed to cancer, Grand Chief Ed John recited a prayer in his native Carrier language. Upon leaving the grave of his friend Rosa Moreno, Soto said that he has considered moving away from his home to someplace with less contamination. But the love he has for the Amazon and the value he places in remediation have kept him in the struggle. His days are thus spent supporting the development of a thorough clean-up plan for the time when there will be funds to implement it — as well as rescuing ancestral plant knowledge to help treat the various illnesses rampant in his community. Attorney Donziger and his colleagues have committed to see the case through to the end, refusing along with Soto and the other Ecuadorean plaintiffs to settle with the corporation for anything less than the full amount necessary for comprehensive remediation of the damage. “We have to keep going because we have learned through all this … that there are people suffering all over the world from oil companies and the cult of money — it’s terrible,” Soto says. Lindsay Ofrias is a PhD candidate at Princeton University. Her research focuses on human rights and conflicts related to oil and gas extraction, particularly in the United States and Ecuador. 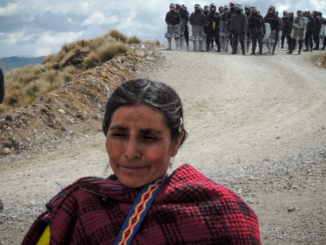 Is Justice Possible in Canada or Guatemala for Hudbay Minerals/CGN Mining Repression?